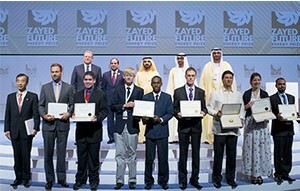 Key players in the off-grid lighting market scooped top prizes in the Zayed Future Energy Prize 2015 announced earlier this week at the Abu Dhabi Sustainability Week, UAE. Panasonic, whose solar lantern meets the Lighting Global Quality Standards, and has won awards from the International Association for Universal Design (IAUD) and the Japan Institute of Design Promotion for its design, took home the top prize in the Large Corporations category. M-KOPA Solar, the market leader in ‘pay-as-you-go’ energy services for off-grid customers, took the top prize in the SME category of the competition. “This is in our minds the most prestigious award in the world for renewable energy companies and comes with a generous US $1.5M cash prize, which we shall use to launch our new M-KOPA university training program for staff and sales agents,” says Jesse Moore, the Managing Director and co-founder of M-Kopa. In less than 3 years since its launch in October 2012, M-KOPA Solar has connected more than 150,000 homes in East Africa to solar power. The company has a goal of connecting one million off-grid homes by 2018. “We know that this recognition comes with even higher expectations! We believe that we are still at the early stages of what we will achieve as a business, now connecting over 500 homes per day, but putting our best efforts into scaling our reach faster, in order to reach millions of homes in years to come,” says Mr. Moore. Another key player in the off-grid lighting market in Africa who featured strongly in the competition was SolarAid, which made it the finalist stage of the competition in the Non-Governmental/Non-Profit Category. Former US Vice President Al Gore was named the Award’s 2015 Lifetime Achievement winner for his “unwavering personal and political commitment to raise international awareness on climate change, while reinforcing optimism that the global community can and will successfully tackle the challenge”. Launched in 2008, the Zayed Future Energy Prize was envisioned to recognize and reward innovators in the fields of renewable energy and sustainability.